Players execute their turns in clockwise order. A player's hand consists of his un-played personality cards. A player's turn consists of playing 1 card from their hand and executing the related actions. All played cards form a personal discard pile showing only the last card played. With the Tribune, a player takes back all cards previously played. The game ends either after a player purchases the last card from the display on the board, or after the first player builds his 15th house. 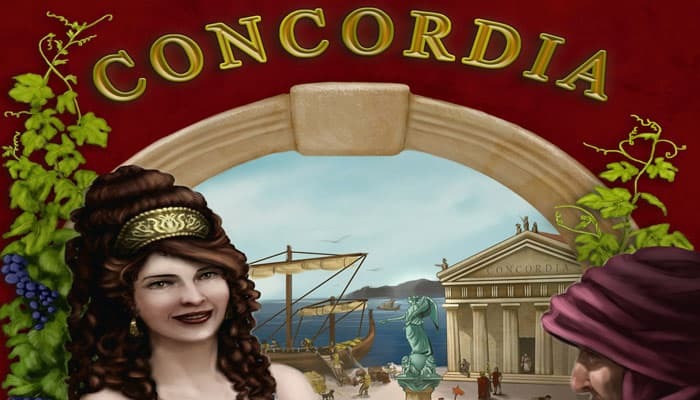 In either case, this player is awarded the Concordia card. Now all other players execute their final turn and then all players tally their final victory points. Each personality card is related to an ancient god. These gods individually reward certain achievements (for instance number of populated provinces, number of colonists, etc). 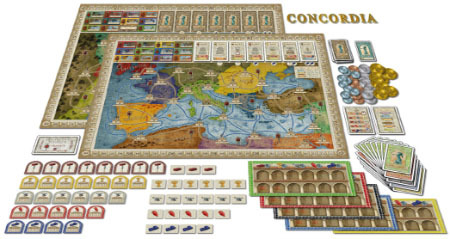 If Concordia is played for the first time, it is recommended to conduct an intermediate scoring. The player recovers all of his previously played cards back into his hand. 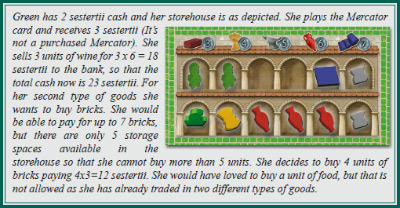 If the player takes back more than 3 cards (including the Tribune in the count), he receives 1 sestertius per card past the 3rd from the bank. In addition the player may optionally purchase 1 new colonist by paying 1 food and 1 tool to the bank and placing either a new land or sea colonist from his storehouse into "Roma". The number of colonists a player has on the board determines the number of possible movement steps that a player can freely allocate to his own colonists. Land colonists are moved only along the brown lines and sea colonists only along the blue lines. A colonist's first movement step is out of his starting city onto an adjacent line. Any further steps will move the colonist through a city and onto the next adjacent line to that city. At the end of his movement, a colonist cannot be placed on a line that is already occupied by another colonist. However, a colonist is allowed to move through occupied lines, adding the occupied sections passed through into his movement count. Goods: 1 food in a brick city, or 1 brick plus the good of that city type in every other city. Coins: 1 sestertius in a brick city, 2 sestertii in a food city, 3 in a tool city, 4 in a wine city, and 5 in a cloth city. If a new house is built in a city where there are already other houses, the cost in coins is multiplied by the number of houses that will be in the city after this build (i.e., to build the fourth house in a city the cost in coins is multiplied by 4). The cost in goods remains the same. 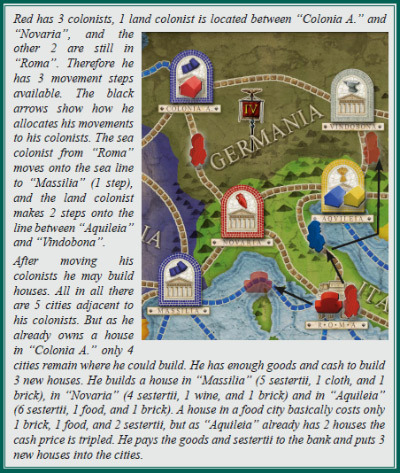 Players may not build more than 1 own house in a single city and never in "Roma". 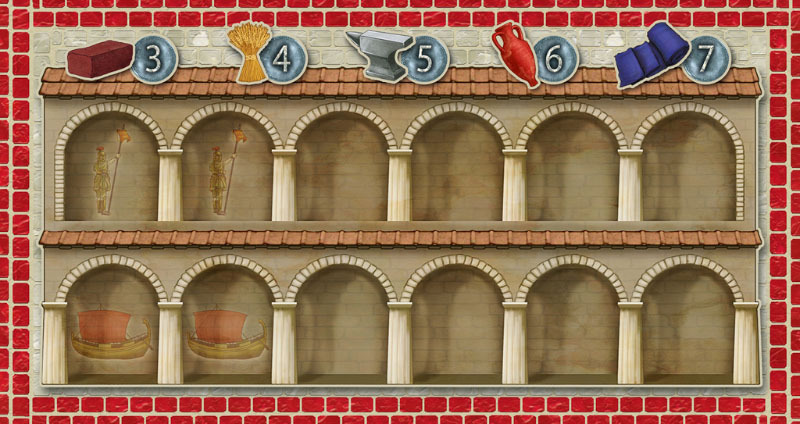 a) The player chooses a province where the houses produce goods. He can only choose an active province whose bonus marker (province tile) still shows the goods symbol. It is not necessary that the player (or any other player) owns a house in the chosen province. He flips the bonus marker of the province to its coin side and receives 1 unit of the goods type depicted on the bonus marker out of the bank. In addition all houses inside the province, regardless of their owner, each produce one unit of the goods produced in that city. b) Instead of producing the player may choose to collect the cash bonus. For every visible coin on the bonus markers he receives 1 sestertius from the bank. Afterwards all bonus markers are flipped back to the side showing their good's symbol. a) The player may place new colonists on the game board each to be paid for with 1 food and 1 tool. New colonists can be placed inside "Roma" or inside any other city where the player owns a house. 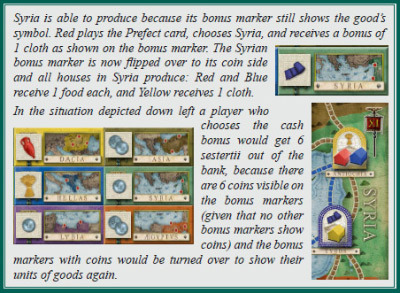 b) The player receives 5 sestertii plus 1 sestertius for each of their own colonists on the game board. The player receives 3 sestertii out of the bank (or 5 sestertii with a purchased Mercator). He may then trade in two types of goods with the bank. This means he may sell two types, buy two types, or sell one type and buy another. The number of units he may sell and/or buy is only limited by the free space inside his storehouse, where every single unit occupies one storage space. The trade is done at fixed prices, which are shown on the roof of the storehouses. The player executes an action from a personality card that is on top of another player's discard pile and thus is displayed face up in front of them. The action is executed the same as if the player had played that card himself. Actions of players who recently used a Diplomat card or took back their cards into their hand with their Tribune card cannot be copied. plus the goods depicted beneath the card's position on the game board, where a question mark stands for a good of the player's choice. The player may purchase one personality card from the display on the game board and take it into the hand. The price consists only of the goods depicted inside the red field of the personality card. 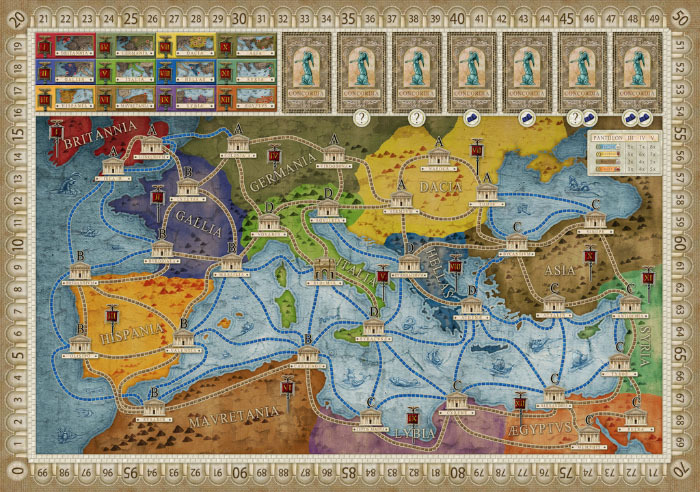 Any goods depicted beneath the card's position on the game board are ignored. As with a SENATOR, the remaining cards inside the display move to the left if their left position is empty, and the display is replenished from the stack (as long as the stack exists). All the player's houses of the related type of goods produce one unit each. 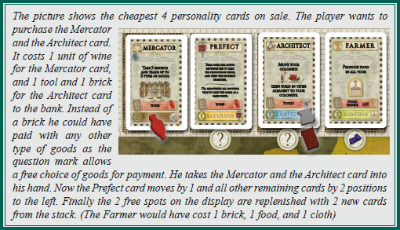 If a player who currently owns the PRÆFECTUS M. plays a Prefect card (or uses one with the Diplomat) in order to let a province produce, he receives a double bonus (2 units instead of 1). Production inside the cities is not affected. After his turn he hands the PRÆFECTUS M. to the player sitting to his right. A player must use the PRÆFECTUS M. when able and may not choose to forego its benefit to keep it for later. But if a player plays a PREFECT card in order to receive the cash bonus, the PRÆFECTUS M. is not activated and remains with the player: it is not allowed to double the cash bonus. Each player has a storehouse with 12 storage spaces. Each space may house either one colonist or one unit of goods. At the beginning of the game, 4 storage spaces are occupied by colonists and therefore are not available for housing goods. However, if a player places new colonists on the game board, additional storage spaces become available. If all spaces are occupied in one way or another, no more units of goods can be taken in. It is not allowed to discard goods in order to make room for other ones instead. If a player receives plenty of goods without having enough empty storage spaces, it is allowed to choose which specific units of goods he wants to take, but not to leave any storage spaces empty. Players are not allowed to trade goods with each other. Goods and coins are considered to be unlimited. The number of colonists is restricted to 6 per player. If a player plays his Tribune card for the first time in the game in order to take his cards back into his hand, he immediately performs a personal intermediate scoring. He scores all his cards as described below for the final scoring, and tallies his VP on the VP-track. After all players have played their Tribune card for the first time and have received the intermediate scoring, these scores are compared and player with the highest score receives 2 sestertii. Second place receives 1 sestertius. If players share the same position, they all receive the same amount (all in 1st place receive 2 sestertii and all in 2nd place receive 1 sestertius). After that, all scoring markers move back to the zero position on the VP-track. We do not recommend performing intermediate scoring if all players know the game well. 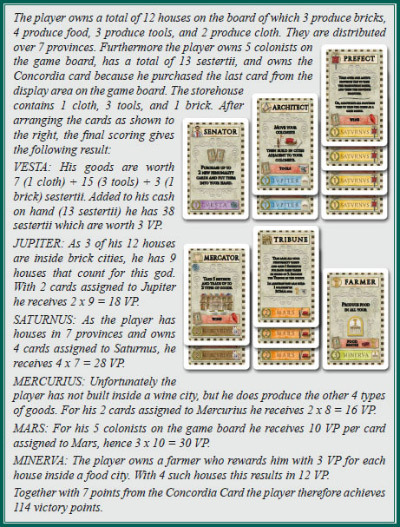 If a player purchases the last personality card and such empties the display on the game board, or if he builds his 15th house, he receives the Concordia card, which is worth 7 additional VP. Every other player now executes his last turn before the final scoring is done as described below. The player with the most VP wins the game. A tie is won by the player owning PRÆFECTUS MAGNUS, or by the tied player who would receive him next in the course of the game. Each personality card is related to an ancient god who rewards its owner with victory points. First players gather all their cards, including the ones from their discard pile, and arrange them according to the different ancient gods. The back of the player aid shows a summary of the gods and in which order they are scored. The victory points assigned to each card that is marked with the respective god are described in the following text. All victory points (VP) are tallied with the player's score marker on the VP-track. It is recommended to first score Vesta for all players, then Jupiter etc. The value of all goods in the storehouse (usual price as depicted) is added to the cash money. Then the player receives 1 VP per full 10 sestertii, any fractions are ignored. For each city of the related city type the player receives a certain number of VP as depicted on the specialist's card.